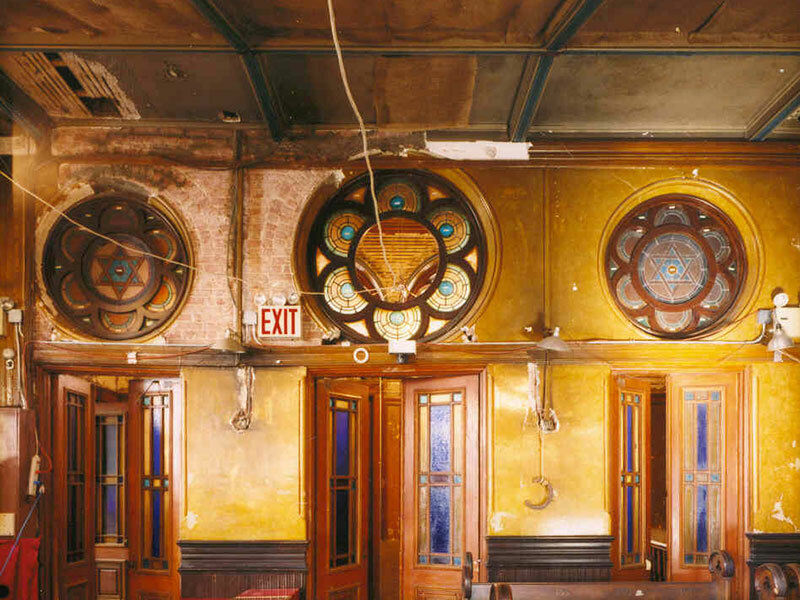 “It was as though the synagogue was held up by strings from heaven,” says Roberta Brandes Gratz, founder of the Eldridge Street Project, of her first impression of the Eldridge Street Synagogue in the early 1980s. 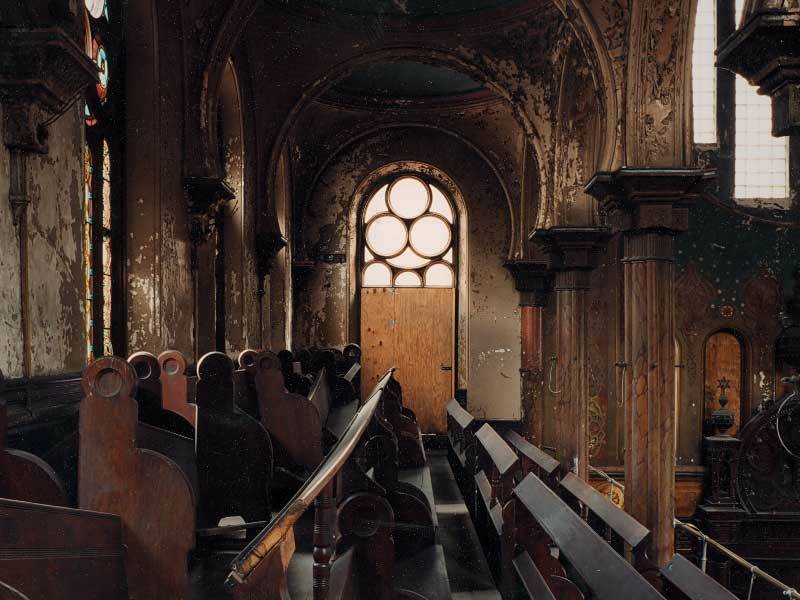 Pigeons roosted in the balcony, benches were covered with dust, and stained glass windows had warped with time. Early investigations showed that emergency stabilization was needed; if no work were done, the building would collapse. Public interest in the synagogue’s fate grew, and by 1986 the Eldridge Street Project (now the Museum at Eldridge Street) was formed to undertake the massive Synagogue Restoration. 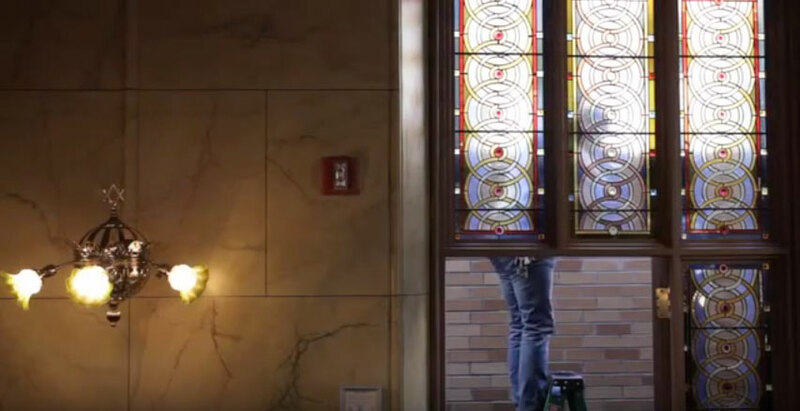 More than 18,000 people from around the country participated in a grassroots effort to restore the synagogue. Hundreds of volunteers participated in “Clean and Shine” days, dusting pews and polishing silver. 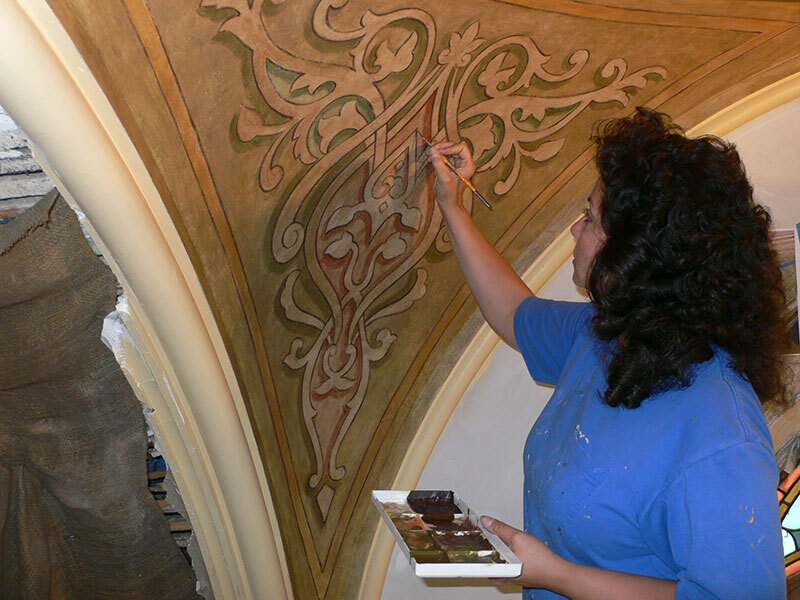 Artisans specializing in historic preservation analyzed every element in the building, including stained glass windows, Victorian glass globes, oak pews, and hand-painted designs on the walls and ceiling. 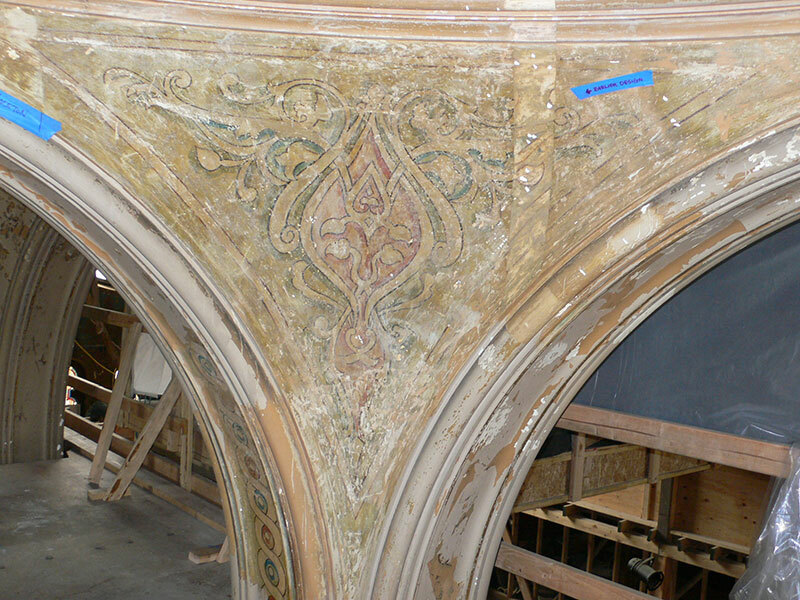 Care was taken to preserve as much of the original fabric of the building as possible. Buildings tell stories. 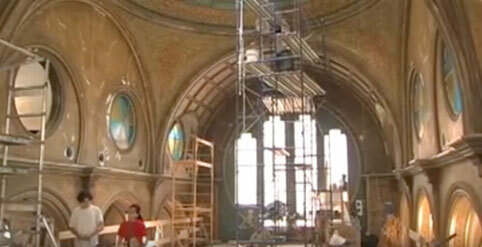 This core belief guided the restoration. 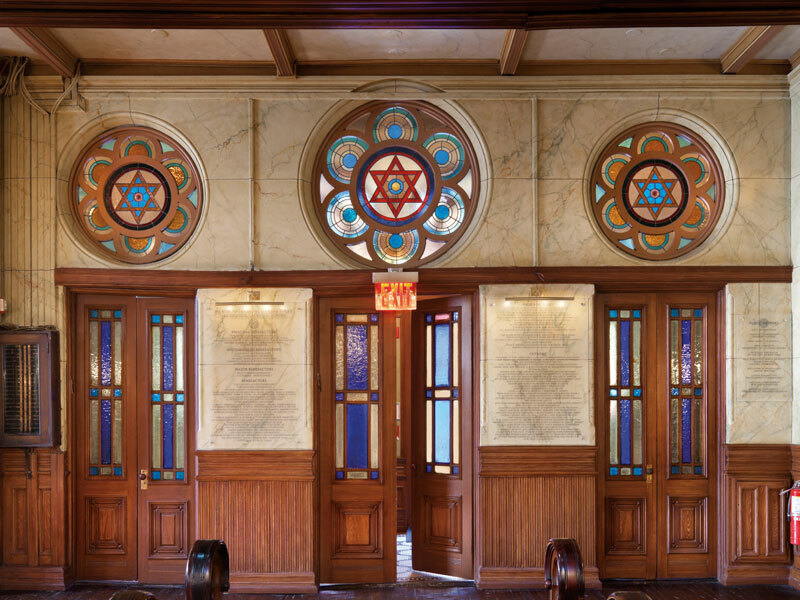 The Museum returned the synagogue to its original grandeur while retaining elements that reveal the building’s 130-year story. When you enter the synagogue, your initial impact is of grandeur and elevation, in keeping with the sentiment immigrant worshippers would have felt 100 years ago. Upon closer observation, though, you discover elements that reveal different eras in the building’s history. 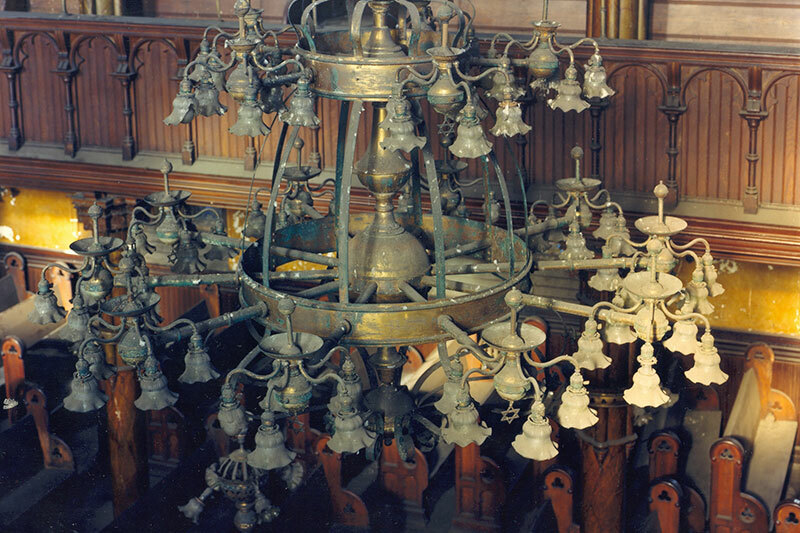 Bare bulbs circling the Ten Commandments and nineteenth-century gas fixtures attest to the synagogue’s conversion to electricity in the early twentieth century. A panel of lath and plaster in the women’s balcony is a poignant reminder of the synagogue’s mid-century period of decline. Worn grooves in the wooden floorboards bear witness to the people who prayed at the synagogue and left their physical imprint here. 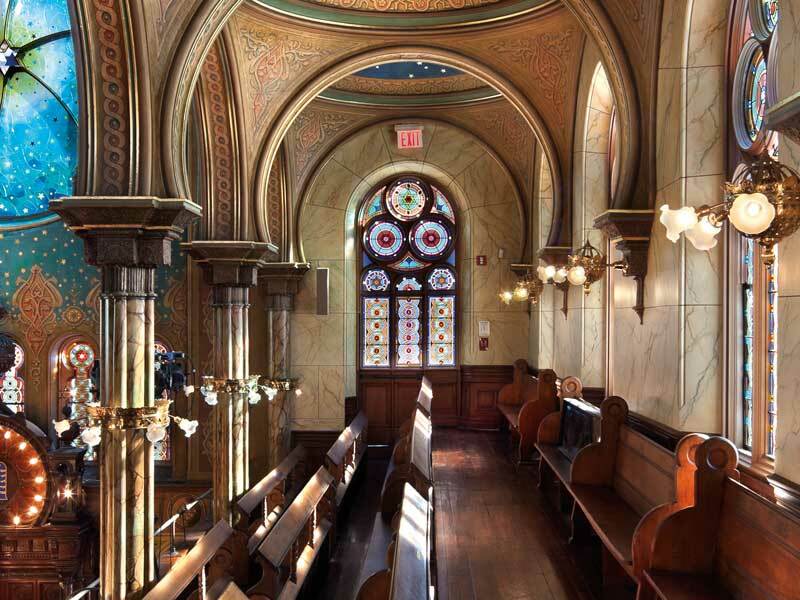 The Eldridge Street Synagogue was hand-crafted by people, used by people, and lovingly restored by a new community. 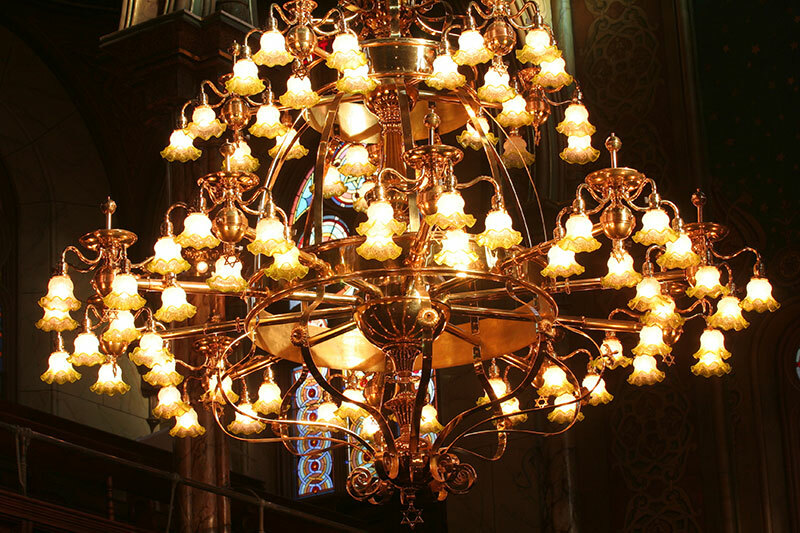 The contemporary workers honored the work of the original artisans, in many cases painstakingly following the line of the original painters or stained glass artisans. 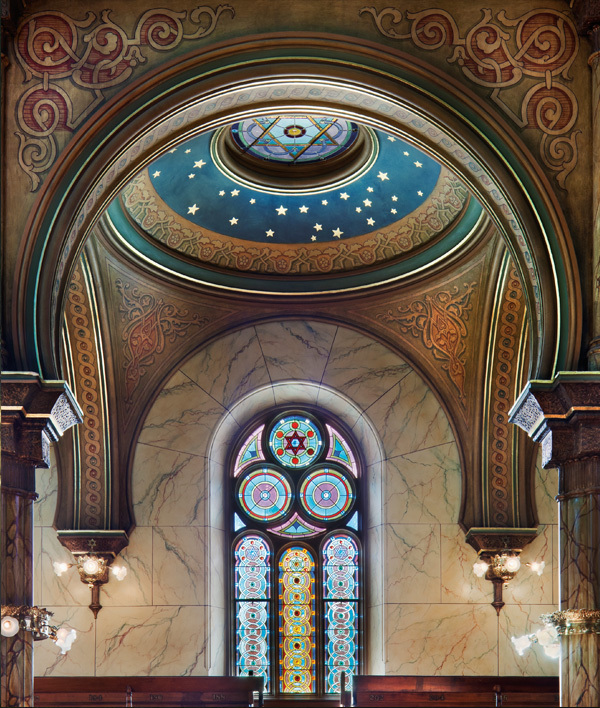 In December 2007, the Museum completed the restoration of the 1887 Eldridge Street Synagogue, a National Historic Landmark. It was a 20-year, $20 million effort with more than 18,000 supporters. 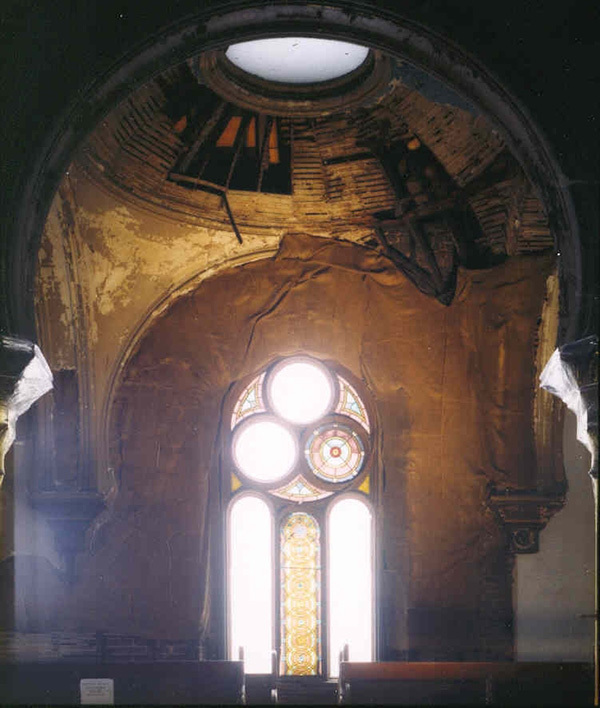 A final crowning element was the addition of a monumental stained-glass rose window by artist Kiki Smith and architect Deborah Gans in 2010. 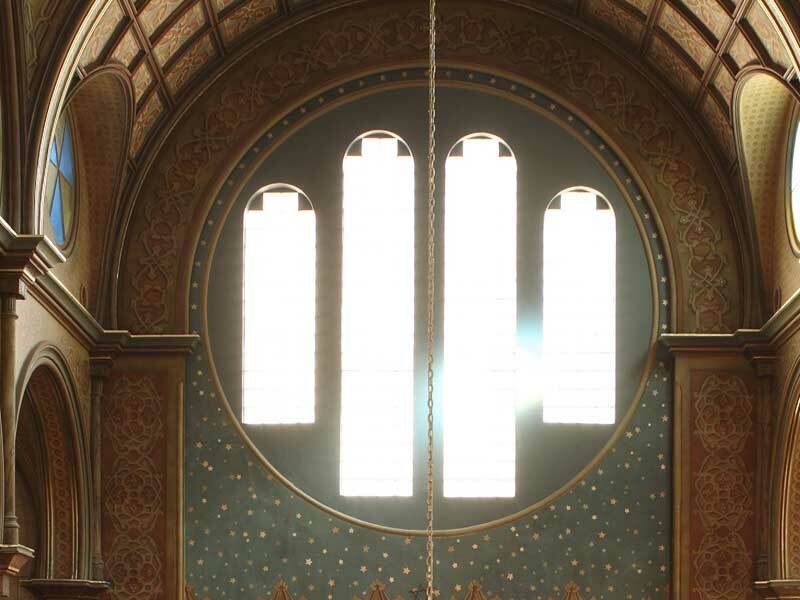 This beautiful sacred artwork is the only contemporary element in the main sanctuary. It marks the revitalization of the building in the 21st century, the most recent chapter in a story that is ever evolving. 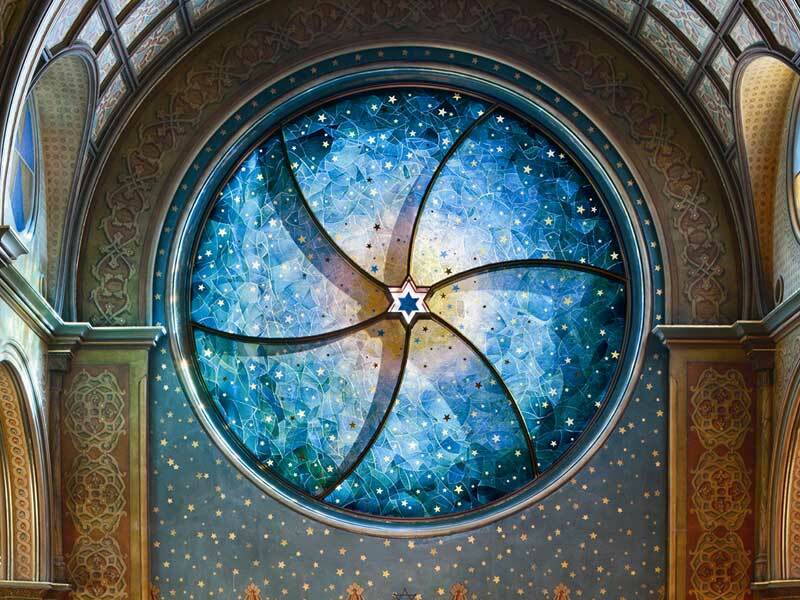 In 1996, the United States Department of the Interior designated the Eldridge Street Synagogue a National Historic Landmark, the highest form of landmark designation. The Museum also gained recognition of the synagogue from the New York State Office of Parks, Recreation and Historic Preservation, and the City of New York for its architectural beauty, its significance as part of the American immigrant experience, and its revitalization as a vital heritage center for people of all backgrounds.